The classic travel enduro retains the values and authenticity of the noble mandello brand and promises unique riding experiences, in keeping with moto guzzi tradition. Presented at EICMA 2017, and having kept to its development and production schedule, the new Moto Guzzi reflects a construction philosophy in which simplicity, practicality and lightness make for an unfiltered relationship between motorcycle and rider. 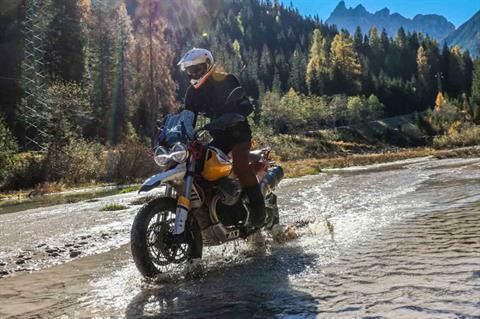 TRAVELLING TO LIVE: The TT acronym, already a part of Moto Guzzi tradition, is an ideal fit for the V85: meaning “tutto terreno”, or all-terrain, it identifies a motorcycle dedicated to travel in its purest and most original form, conjuring up clear images of desert adventures such as the Paris-Dakar. 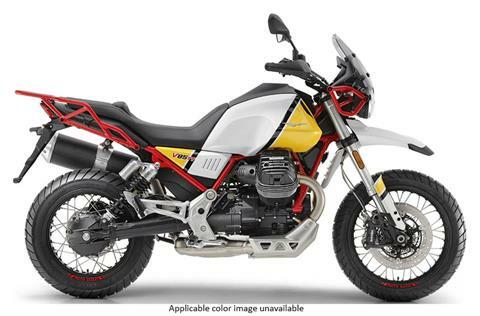 Moto Guzzi V85 TT is the new and original all-terrain that combines style features reminiscent of the golden age of motorcycle adventures with the content and functionality of a modern touring enduro. V85 TT is dedicated to those who, while still dreaming of the Dakar, seek a motorcycle that can also inject adventurous spirit into the everyday journey. V85 TT: THE CLASSIC TRAVEL ENDURO: The fundamental concepts at the heart of the V85 TT project are simplicity, ease and practicality, values typical of those 80s enduro bikes. Moto Guzzi V85 TT achieves its ambitious goal of combining a style based on said values with the needs of a modern touring enduro. This is why it deserves the title of classic enduro, dedicated to touring . Its design combines technology and functionality, with typical Moto Guzzi traits to ensure durability. The desire for simple shapes is clear: with no kind of fairing, the V85 TT is defined by the lines of its tank, its side panels and the front mudguard, as well as its brand-new sculpted 90° V twin engine of course. CHASSIS: FOR THE UTMOST RIDING PLEASURE AND EASE: That Moto Guzzi ability to build superb chassis is once again confirmed with the V85 TT. Only the new Moto Guzzi can boast such a solid and precise front end as it enters a corner; only V85 TT is able to give the rider such a sense of control and safety while seeking excitement on the road. Reduced longitudinal development of the new small block engine allows for a very long swingarm, for safe and intuitive riding. The new asymmetric unit in box-type aluminium features a curved left arm, for a very linear exhaust pipe design and a reduction of lateral bulk. The right arm of the swingarm houses the new shaft drive transmission. V85 TT is the only bike in its segment to use shaft drive transmission, prioritised over a chain drive because it makes no mess and requires no maintenance. A NEW ENGINE, A FUTURE CLASSIC: The V85 TT introduces a new Moto Guzzi engine. Its configuration mirrors that of all Moto Guzzi bikes in production today: an air-cooled transverse 90° V twin with OHV distribution and two valves per cylinder, the pride and tradition of the Mandello Eagle. Engine capacity is 853 cc, thanks to a bore to stroke ratio of 84 x 77 mm. The most modern of all engines in the range, it can boast a ratio of almost 100 HP/litre. Thanks to its complete new design and the use of materials generally destined for race bikes, such as titanium, the new "eight and a half" is able to deliver maximum power of 80 HP and boast an impressive maximum torque value of 80 Nm at 5,000 rpm, with 90% of the torque already available at 3,750 rpm, in keeping with the tradition of the Mandello twin, which has always offered excellent drive even at very low revs. This is the first Moto Guzzi small block engine that can easily reach 8000 rpm, an aspect that showcases its modern and exuberant nature. FIRST-RATE TECHNOLOGY AND CONTENT: Moto Guzzi has designed a complete range of standard electronic equipment, without any inopportune technological overload, for maximum travel enjoyment. To make life on board easier and safer, Moto Guzzi introduces three different riding modes on the V85 TT: Road, Rain and Off-road. Each of these Riding Modes corresponds to a different engine mapping and a different ABS and MGCT traction control calibration, as well as a different response from the Ride-by-Wire accelerator control.